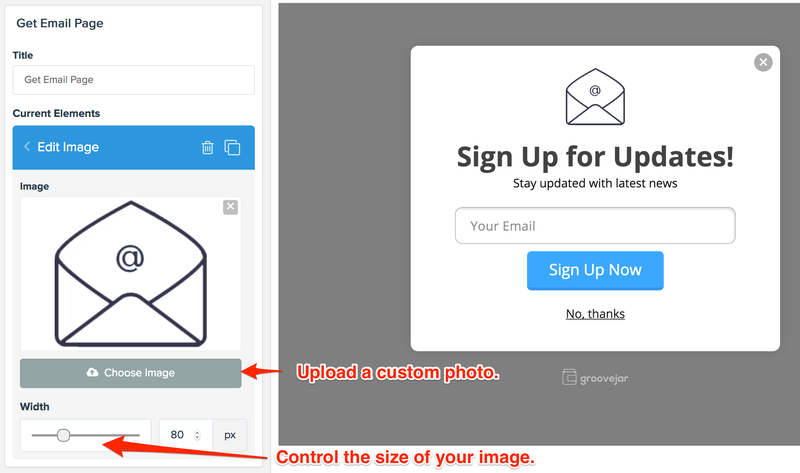 GrooveModular is GrooveJar's fully customizable and fully GDPR compliant popup app! 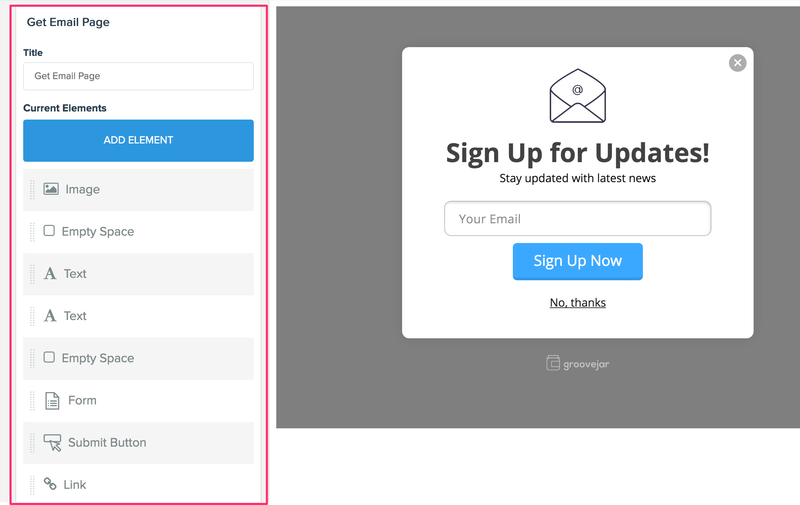 Groove GDPR (Modular) is Groove Jar's robust, fully customizable, and fully GDPR compliant popup app! This app takes customization and personalization to a whole new level, while at the same time allowing you to be fully compliant to the new GDPR data rules. Let's get started setting up our first Groove GDPR (Modular) App! 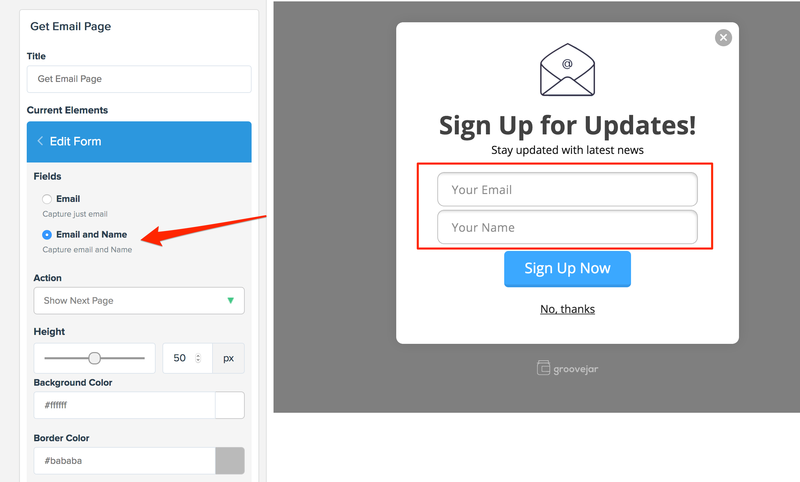 Once you're logged into your GrooveJar account, click the blue button that says, "Click Here to Create a New App." GrooveModular allows for a deep level of customization. There are nearly limitless choices that allow you to design the app in a way that matches your needs and site design. Rounded Corners - Create a more rounded look by shaping sharp corners. Font Family - Customize the font by choosing one of the 13 options. Background Color - You can choose any background color by entering the specific color hex code. Background Image - Upload your own background image, or use one of our crisp default textures. This section takes customization and personalization to an even deeper level. Here, you can rearrange the elements in the list by clicking, holding, and dragging them. You can also click and customize each independent element. Dive into the details here by customizing each element to fit your goals. 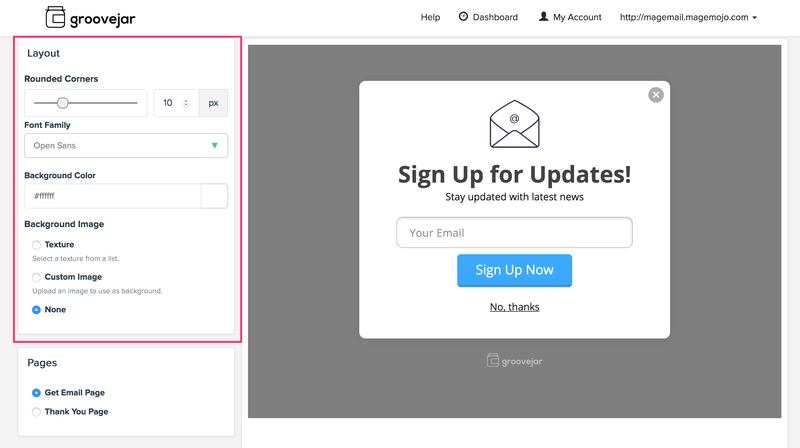 Follow these same steps to edit each of the separate elements that you'd like displayed in your popup. Groove GDPR (Modular) includes features to help you with GDPR compliance. There are several elements that allow you to not only collect more data, but also to ensure your visitor gives explicit consent for their data to be collected. In addition, you can add a disclaimer to your popup to ensure you have explicit permission from the visitor to collect their data. To do this, click the big blue, "Add Element," button. Important: The template disclaimer text is only a sample and should be customized by you to ensure that it adheres to your particular policies as they apply to GDPR guidelines and best practices. 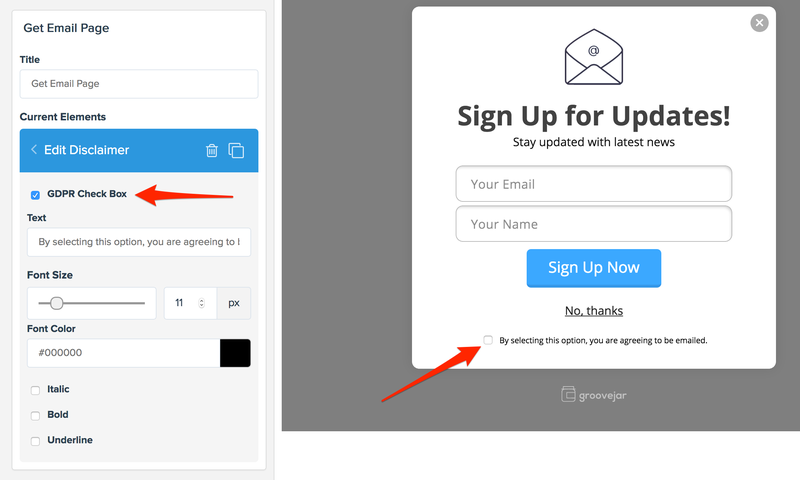 GrooveJar will record explicit opt-in via this form, including Personal Identifiable Information (PII) and the day and time of opt-in. Note that this is not legal advice and you should speak with your attorney should you have any questions or concerns about GDPR compliance. 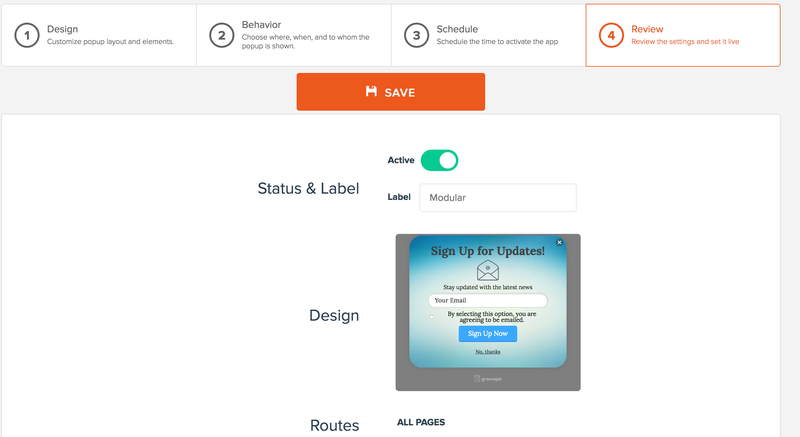 When you've completed the design customization and you're happy with the look, press the orange "SAVE" button at the top of the screen. You'll be automatically directed to the "Behavior" settings. This is where you'll decide where, when, and to whom the popup is shown. You can choose to display the app on all pages, or only on certain pages. If you'd like to display the app on all pages, simply select the "All Pages..." choice and do not add any blacklisted items. If you'd prefer the app only show in specific pages, select the "Just in These Pages" option. When you select that option, you'll see that "Blacklist Items" changes to "Whitelist Items" and you can add the specific URLs of where you'd like the app to be shown. You can choose to trigger the app to appear on exit intent, which is when the system recognizes a visitor's intent to exit your site. Alternatively, you can choose to trigger the app on a timer. Lastly, you can choose to trigger the app when the visitor scrolls to the end or bottom of your website. Here, you can choose to show the app to all your site visitors, new visitors only, or to returning visitors. You can also set the maximum number of times the app will show to a given visitor by adjusting the "Maximum number of attempts" box. Next, you can schedule the app to be displayed during a preset period of time. If you do not enable this feature, the app will appear immediately. Note, if you enable a begin/end time, be sure to convert your local time to UTC time. Google can help you convert if you need a hand. Lastly, be sure to review how your app appears and toggle it to "active" if you're ready to launch! When you've got all the settings just the way you want them, don't forget to click the orange "SAVE" button towards the top of the page. Need a hand or have a question? Don't hesitate to ask!